This vegetable terrine was inspired by Blaise, a regular PhamFatale reader, who suggested this vegetarian dish. I adapted it this week in anticipation of Cinco de Mayo. 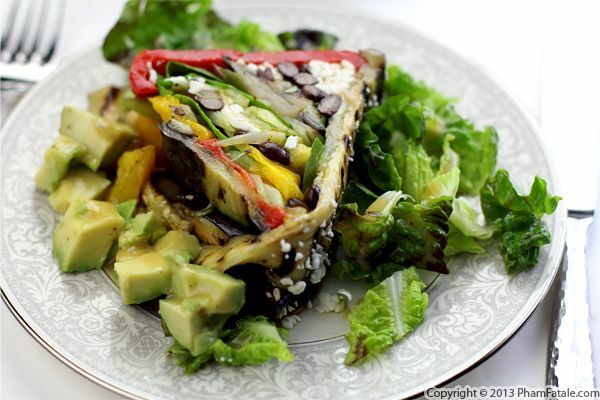 I layered grilled eggplant, tri-color roasted bell peppers, sweet basil leaves, celery, fresh pineapple, black beans and a lot of Oaxacan cheese. The key to creating the terrine is to make sure the layers of flavors are tightly packed to showcase the colorful display. I garnished the vegetable terrine with shredded red oak leaf lettuce, diced avocado and crumbled queso fresco (Thank you, Queso Del Valle!). The last step is a flavorful salad dressing; I prepared this one with delicious champagne vinegar from our good friends at Bellindora. Want to see more? Make sure to like PhamFatale on Facebook for exclusive new dishes and follow @phamfatalecom on Twitter for instant culinary news and more photos on Instagram and Pinterest. I love grilling vegetables. 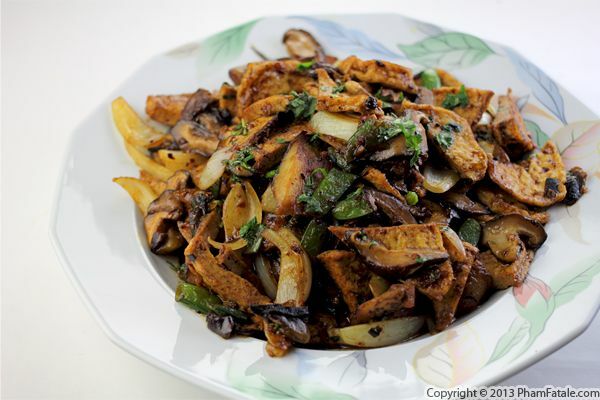 They can be served as is as a side dish or coarsely chopped in a salad. They also can act as the basis of flavorful spreads. Recently, I opted for the latter and created a smoky eggplant spread flavored with onion, garlic, grape molasses, tahini, a few herbs and sea salt; to ensure the eggplant would blend smoothly in the food processor, I added delicious Chardonnay cider I discovered at Trader Joe's. The result is out of-this-world delicious. You could stop the work right there and serve the spread in a bowl with lavash bread or pita bread, but I fancied it up by using it as a filling in mini-tartlets. 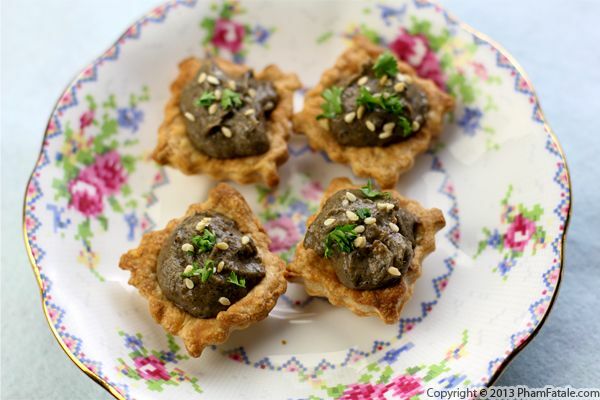 This appetizer is not only cute, it's very easy to prepare. I let the girls prepare the eggplant spread and assemble the one bite-sized appetizers while I was preparing dinner. I had two goals in mind. First, it kept them occupied and they had fun at the same time, instead of asking "is dinner ready yet?" The second main reason is that now since they now know how to make this, they can help out with very little supervision whenever we have guests over. I find it very valuable to get the girls involved in the kitchen. They appreciate food more when they know where it came from, and as I keep reminding them, they'll be thankful to know basics when they're on their own at college. 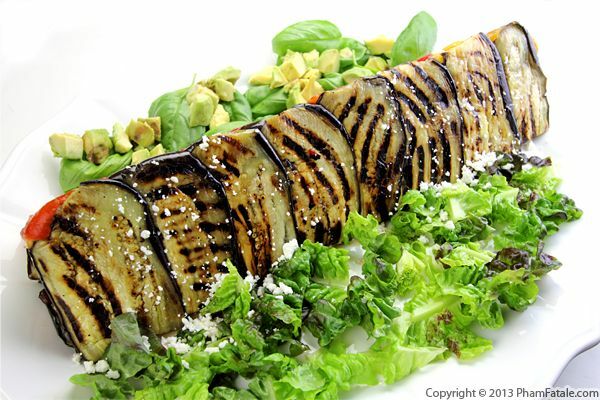 This is a healthier version of eggplant Parmesan, but just as tasty. I used a limited amount of cheese in this dish, and filled grilled eggplant with white beans. The white beans have a soft texture and add a bunch of protein to the dish, making it a viable main course option for vegetarians. I still had a leftover jar of marinara sauce from last summer and the sauce tasted amazingly good. Everyone loved this dish and the best part is that no one felt guilty having the decadent dessert I made afterwards! 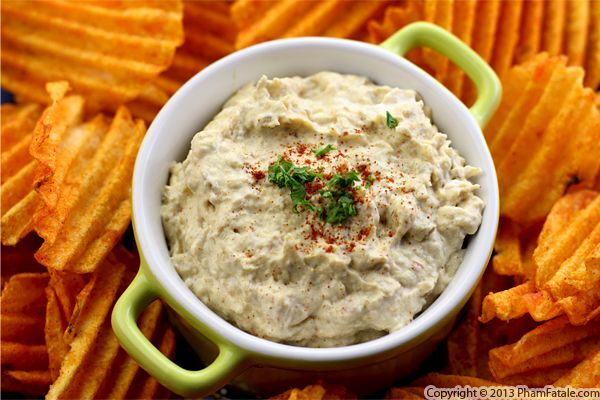 Here's a recipe for an eggplant cheese dip. 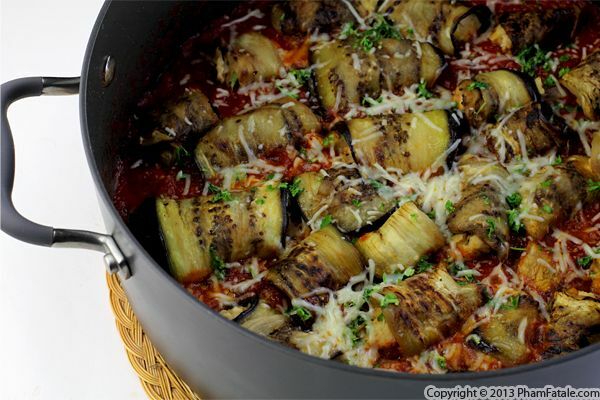 Very flavorful roasted eggplants are mixed with tomatoes that have been cooked until softened, then the mixture is folded into fluffy mascarpone cheese and Romano cheese. The last step is to warm up the dish for a few minutes and wait until it gets bubbly. I paired the warm dip with sweet and smoky barbecue ruffled chips, which serve two purposes: the texture makes it easy to scoop out the dip, and their smoky undertones manage to stand out against the robustly flavored dip. We're days away from the Super Bowl! Hope your party planning is going well! If you're still looking for inspiration, I'm going to keep posting some recipe ideas until the big day. Page 5 of 7 pages.